Meet Kelli. She is our member success story this month. She is a busy mom, full-time Mayo Clinic employee that lives 20 miles outside of Rochester and yet, she still finds time to make it to the Dan Abraham Healthy Living Center on a regular basis. Here is her story. 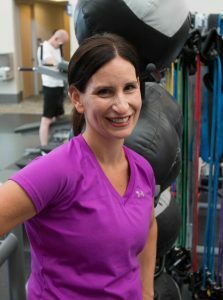 Incorporating regular exercise into her life was not a new idea for Kelli, who began running regularly about 20 years ago. High mileage was her routine for about 10 years until her kids were born. Then she began to deal with one the biggest challenges we can all face in maintaining our fitness - time! "After I had my kids it became so difficult to balance work, kids and time for myself." She found that, if works demands allowed, midday worked for her. "I started coming over the noon hour and felt good about getting in the time for cardio. This continues to serve me during the work day. I've changed things up a bit with adding strength training and altering my cardio from just running to adding the elliptical for some variety." Also, Kelli made some friends at the Center and this has enhanced her commitment to keeping a regular pattern of exercise. "I made some friends at the DAHLC - we would meet to exercise and talk. This motivated me in terms of exercise and nurturing those relationships." In terms of maximizing her time, having close proximity to the work place has been essential. "I've found satisfaction with taking time midday to work out and see others who have the same goals. I need time to recharge and find that I go back to work more productive. I also feel I'm better when I go home to be with my kids and spend time with them." So Kelli has found ways to get her workout during the workday, taking advantage of the wide variety of equipment and recognizing what works best for her. Thank you Kelli, for sharing your story and inspiring us to take on our own time challenges! If you are looking to start your healthy living journey, but are fighting with time to fit in a workout, try one of our express drop-in classes. These classes are designed for you to get a quick and effective workout in 30-minutes or less!